This single, number 8, I think for Die Stasi is a split from Electric Bunnies and Pink Reason, I'm not sure I have a clear view of the Bunnies yet or Pink Reason for that matter, and that's exactly why they were both warranted another single and picking this up. 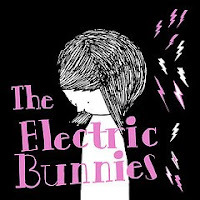 The Electric Bunnies are sounding different here then I remember them (big surprise) from a single a little while back on Columbus Discount...that seemed a lot more jokey, saying 'sweet robot' with robot vocal effects and glitchy keyboards, it's not rocking out garage, low-fi...I think I saw the academy annex call it 'sci-fi pop', and I like that as good as anything. They aren't painting themselves in corner anyway. On 'Colorful Teardrops' they have the same kind of elements as their other singles...keyboard melody and drone, completely off key layered electric guitar notes, backwards drum machine...then the echo vocals come in...all heavy on the repetition. It's like they played this little melody accidentally and looped it. Although that melody is enough to drive you a little insane. The second track on this EP, gets away from the slow niceness and brings a little noise...this is live room sounding track, yelling right after the drums kick in. Guitar echo feedback screeching in between verses. They are just weird, and I appreciate that, playing with a lot of styles...whatever works for them, they might have it down, but I'm still trying to find their sound. The second track 'Watching You Fall' is the best....it's taking me back to old Sebadoh, or Eric's Trip....super muddy, sounds kind of live and overdubbed later. Real deep groove...off in the distance. Dark vocals...layers and layers of retakes, punching instruments in, boosting levels with no compression. There's a huge layer of mystery thrown on top. It's a different era Ariel Pink, nailing something you don't know why you like but you do. This sound just feels like it's from another world, it's going to be hard to figure out....good luck. I feel like I'm in the same place I started, no closer to developing any kind of theory about where either of these bands have been or where they're going. Oh well, I'll have to get another one when it comes out. Both bands take a stab at some pop with the Bunnies making a mosaic named "Colorful Teardrops" and Pink Reason teaching a lesson in pachydermy called "Hey Girl." Enough ivory on that one to return a couple tusks! "Rest your head on a cloud while flower petals sprinkle from the heavens" is a down-under style Thumper and the Electric Bunnies second offering on this one. Make sure your stereo is fit. And then we got some vintage Pink Reason drag: "Watching You Fall" Some say its Kevins best track--it sticks to the ribs, boy. PINK REASON/ELECTRIC BUNNIES split 7" is HERE!